In general terms, for an activity to be classified as gambling in Australia, it must involve the staking of money or other valuable consideration of real-world value on the outcome of an event determined in whole, or in part, by chance and with the objective of winning a prize. Where an activity does not satisfy these criteria, it is not generally considered to be gambling under Australian law. ‘Trade promotions’, being free-to-enter competitions for the promotion of trade,2 are also regulated under gambling legislation in each jurisdiction. These competitions are subject to specific restrictions and, in certain jurisdictions, are only able to be conducted where a permit has been issued by the relevant regulator. Fantasy sports operators have existed in the Australian market for some years. Initially, they were regulated as a form of trade promotion, whereas now they are treated by regulators as a form of bookmaking. No specific regulation of ‘pool betting’ exists in Australia. Exclusive licences are granted to totalisator operators in all Australian jurisdictions. These operators are licensed to accept bets relating to a contingency (generally, the outcome of a racing or sporting event), which are then contributed to a pool that is paid out by reference to successful bets (after the operator deducts a percentage of the pool as commission, as well as various fees and taxes). Spread betting and betting on financial products are regulated by the Corporations Act 2001 (Cth). To be conducted legally, operators must obtain an Australian Financial Services Licence. These products are regulated under a different regulatory regime to gambling products; however, in certain circumstances a sports betting licence may also be obtained. d land-based casinos where casino games, including poker, baccarat and blackjack (among others) can be played. The paternalistic approach to the regulation of gambling services by the state and federal governments is a response to the concerns that arise from the adverse social consequences associated with gambling. However, gambling has long been a part of Australia’s culture and identity and, together with racing and sport, is well established in the national consciousness. State and territory-based regulation of gambling in the early 20th century marked the beginning of the legislative regime in place today. With the introduction of online wagering in the late 20th century, the industry continues to flourish, despite the continuing conflict between the economic returns provided by the gambling sector to the state and territory governments, and sporting and racing bodies, and the pressure for governments to take action to minimise problem-gambling behaviour. Historically, all the lottery and totalisator operators were government-owned entities. Almost all states and territories (Western Australia being the exception in respect of its totalisator and lottery) have corporatised and privatised their gambling operators. All leading gambling businesses in Australia (most of whom are listed) conduct business under a licence granted by a state or territory government (or regulator). f CrownBet Pty Limited (owned by The Stars Group), a sports bookmaker that recently acquired William Hill’s Australian operation (see Section VIII, below). In Western Australia, the totalisator and lottery are conducted through state-owned corporations, respectively operated by Racing and Wagering Western Australia and LotteryWest. However, the Western Australian government is expected to follow the lead of other states and territories and conduct a tendering process in the near future in respect of the exclusive licence to operate the state’s totalisator. Separate exclusive licences are also issued in each state and territory in respect of the conduct of Keno games in land-based retail venues. Save for Queensland, the right to operate a casino has been the subject of an exclusive licence in the relevant jurisdiction. The recent issue of new casino licences in New South Wales and Queensland is discussed further in Section II, below. Wagering services are not only provided by totalisator operators (who also provide fixed-odds betting services) but also by on-course bookmakers (some of whom also operate online) and corporate bookmakers (mostly licensed in the Northern Territory). As mentioned in subsection iii, above, licences to conduct gambling are issued by the relevant state or territory government (or regulator), including those listed in Section II, below. Traditionally, gambling was conducted solely in venues. However, as a result of new technologies and the challenges posed by gambling monopolies in most Australian states and territories, a number of gambling businesses (particularly in the wagering sector) are licensed to conduct gambling remotely. This includes corporate bookmakers, most of whom are subsidiaries of leading European online betting companies. However, it is generally understood under principles of Australian constitutional law that gambling services provided under a licence issued in any state or territory of Australia are able to be provided to residents of other Australian states and territories. This principle was confirmed by the decision of the High Court of Australia in Betfair Pty Ltd and Another v. Western Australia (2008) 244 ALR 32. Each licensing jurisdiction imposes different licence conditions on its licensed operators, by reference to the relevant legislation. Most online corporate bookmakers, for example, are licensed in the Northern Territory by the Northern Territory Racing Commission (NTRC). In 2001, the federal government enacted the Interactive Gambling Act 2001 (Cth) (IGA), which prohibits the provision of ‘interactive’ (or online) gambling services with an ‘Australian customer link’. The IGA is enforced by the Australian Communications and Media Authority (ACMA) and the Australian Federal Police. In September 2017, the IGA was amended by the Interactive Gambling Amendment Act 2017 (Cth) in response to claims that the existing legislation was ineffective. The amendments, among other things, increased penalties and gave the ACMA greater investigative and enforcement powers (see Section VII, below). Broadly speaking, the IGA prohibits the provision of ‘prohibited interactive gambling services’ to persons present in Australia (the Section 15 Offence), and ‘regulated interactive gambling services’ without an Australian licence (the Section 15AA Offence) (together, the Operational Prohibitions). Regulated interactive gambling services include wagering services (with the exception of in-play sports betting services provided via an internet carriage service, including VoIP technology, which is prohibited) and lottery services (with the exception of instant or scratch lotteries, which are also prohibited). In addition, the IGA prohibits the advertising in Australia of ‘prohibited interactive gambling services’ and, unless the relevant party is licensed in Australia, ‘regulated interactive gambling services’ (the Advertising Prohibition). The IGA targets the supply of online gambling to residents of Australia by offshore operators, but does not prevent Australian residents from accessing those offshore services, or the provision of services by Australian operators to customers in other countries. A defence is available where the operator did not know, or could not reasonably have known, that their service had an ‘Australian customer link,’ that is, that any or all of the customers of the service were physically present in Australia. Australia is a federation. In practice, this means that legislative power is divided between the federal government and the eight constituent states and territories. Traditionally, the power to regulate gambling activities in Australia was reserved by the states and territories. This changed in 2001 with the enactment of the IGA. Save for legislative reform proposed by the federal government in 2012 to regulate the sale and use of poker machines (which is no longer in effect, save to a limited extent), and the IGA, the federal government has recognised that the regulation of gambling is a matter within the jurisdiction of the states and territories. The IGA prevails over state and territory legislation to the extent of any inconsistency. That is, even where certain conduct does not contravene the IGA, it may nonetheless be in breach of state and territory gambling laws. Whereas the IGA regulates interactive (or online) gambling services, state and territory legislation continues to regulate land-based gambling activities3 and sets out different regulatory frameworks for different types of gambling, including casinos, sports betting, poker machines and lotteries. Even though the federal government’s proposed poker machine regulation in November 2012 was unsuccessful, there remains the possibility that the federal government may intervene in the future to regulate further land-based gambling, particularly poker machines. In addition to regulating the manner in which land-based gambling is conducted, legislation in each state and territory also establishes separate regulatory bodies. In certain states and territories, a different regulator is responsible for the regulation of casinos. For example, the Independent Liquor and Gaming Authority is responsible for determining the regulatory arrangements that apply to the operation of casinos in New South Wales. Certain racing and sporting bodies have also been given the right to regulate certain activities of individual and corporate licensed bookmakers. The Australian legislative framework for the gambling sector distinguishes between remote and land-based gambling; both are regulated at the federal and state and territory levels. As indicated in subsection i, above, interactive (or online) gambling services are regulated at the federal, and state and territory levels, while land-based gambling is regulated mostly at the state and territory level. At the state and territory level, the distinction is due in part to the different regulatory frameworks that exist for the different types of gambling services, such as casinos and gaming machines. In addition, the distinction can be attributed to the rapid evolution of the market and the often outdated legislation at the state and territory level. For example, in New South Wales, the Unlawful Gambling Act 1998 (NSW) (NSW UGA) does not contemplate online gambling. However, the preferred position of Liquor and Gaming NSW, the New South Wales regulator, is that the NSW UGA applies equally to both online and offline forms of gambling. Land-based gaming is regulated largely by state and territory legislation, which is principally directed at gambling products or services that are venue-based. These include operators of wagering and lottery terminals, and poker machines. However, certain federal laws apply to land-based gambling, such as the laws relating to anti-money laundering and counter-terrorism financing (see Section IV, below). Generally, an exclusive licence has been granted in each state or territory to conduct off-course betting in retail venues. Similarly, an exclusive licence has been granted to provide lottery products (which are available for sale by retailers, principally in newsagents). Further, licensed venue operators are permitted to conduct land-based machine gaming (such as slot machines, known in Australia as poker machines). These venues include casinos, pubs and clubs. The sole exception to this principle is in Western Australia, where poker machines are only permitted in casinos. Certain restrictions are imposed on the operation of gaming machines by licensed venue operators, such as caps on the total number of poker machines in any particular venue, locality or in the jurisdiction as a whole. The regulatory regime in respect of poker machines differs substantially from jurisdiction to jurisdiction with Victoria, for example, having a mandatory pre-commitment system in place (which players can opt out of). Until recently, there was a limited number of casino licences granted in each state and territory. However, in recent years, this exclusivity has been relaxed. Previously, in New South Wales, the exclusive casino licence was held by Echo Entertainment Group Ltd (now The Star Entertainment Group Ltd). In 2015, the New South Wales state government granted a licence to Crown Resorts Limited for the construction and operation of Crown Casino at its new Barangaroo development in Sydney (which is scheduled for completion in 2024). Similarly in Queensland, the government has granted additional casino licences to various private entities. Various restrictions exist at the state or territory levels that apply to licensed online wagering operators (even where based in another state or territory). These restrictions set out mandatory requirements relating to advertising, warning messages and pre-commitment as well as a requirement to pay a product fee in respect of races and some sporting events that take place in that state or territory. The IGA prohibits the supply of online gambling services to persons present in Australia, unless the service provider is licensed by a regulatory authority in an Australian jurisdiction. However, the ability of wagering operators to provide in-play sports betting is restricted to bets placed over the telephone via a voice call or via a ‘place-based betting service’, that is, online in-play betting on sporting events using ‘electronic equipment’ at the venue of a licensed operator. Generally speaking, licensed operators may offer remote or online gambling services and no distinction exists between the online platforms or devices on which a gambling product may be offered to customers. Licences granted to Australian operators to provide gambling services online often impose restrictions on the location and manner in which the licensed operator may conduct its gambling business. For example, gambling operators licensed by the NTRC are required to locate various aspects of their gaming operations in the Northern Territory. In addition, the conditions of the licence have the effect that bets are deemed to be placed, received and accepted in the Northern Territory for the purposes of the licence, irrespective of where the customer placing the bet is located. Depending on the gambling service, ancillary licences may be required in addition to the principal licence granted to the operator to conduct the gambling business. For example, in addition to those operators that conduct gambling activities in a casino or other land-based venue, separate licences are required to be held by manufacturers and suppliers of poker machines, as well as testing agents. In most cases, key employees or close associates of licensed operators are required to hold a separate licence, or at least be approved by the regulator prior to commencing their role. The process involved in applying for a licence to conduct a gambling business in Australia depends on the type of licence and the jurisdiction in which it is sought. For example, in respect of remote wagering, the Northern Territory is the leading licensing jurisdiction in Australia and licences are granted by the NTRC. While other states and territories have their own licensing regimes, these regimes have not been ‘tried and tested’ in the same way as the Northern Territory regime. There are a number of licensing options, depending on the nature of the gambling service to be provided. Licences may be granted to conduct bookmaking and online lotteries. For simplicity, we have limited our response to the process relating to the grant of sports bookmaking licences. In order to be eligible to obtain a licence, applicants must be registered in Australia as a corporate entity under the Corporations Act 2001 (Cth). The company and key personnel must also meet suitability and probity requirements prescribed by the relevant licensing authority. f a Deed of Release and Authorisation to enable the regulator to conduct all necessary inquiries. The licensing process will typically last for up to nine months. The probity process involving land-based casino licences may involve a period of over a year. The duration of the licence will depend on the nature of the gambling service being provided and the agreement reached between the licensing authority and the operator, as set out in the licence conditions. In light of the investment required in respect of land-based gambling operators, exclusive totalisator and casino licences typically remain in effect for a term exceeding 10 years. Restrictions on the manner in which a gambling business may be conducted are usually contained in the terms and conditions of a licence and the underlying legislation. Failure to comply may lead to sanctions for breach of the licence, contravention of prohibitions set out in the relevant legislation, or both. This most frequently arises as a result of periodic reviews conducted in connection with the operation of a casino. In many cases, the casino may be found not to have complied fully with the terms of its licence, resulting in the imposition of a fine and other penalties. As it is beyond the scope of this chapter to outline the full framework for liability, our analysis is set out in general terms. Offences and sanctions in respect of non-compliance with licence conditions and the relevant laws vary between the states and territories. At the federal level, the Operational Prohibitions under the IGA carry significant a penalties of up to 5,000 penalty units for a criminal offence (equivalent to A$5.25 million for a corporation) and 7,500 penalty units under the new civil penalty provision introduced by the Interactive Gambling Amendment Act 2017 (Cth) (equivalent to A$7.875 million for a corporation), see Section VII, below. Generally, liability is placed on the operator of a prohibited gambling service rather than the customer for the participation in such services. However, liability may be placed on individual users of gambling services in limited circumstances. For example, gambling legislation in New South Wales and Western Australia prohibits the placement of a bet on an Australian race with an unlicensed wagering operator. Notwithstanding these prohibitions, we consider it unlikely from a policy perspective that authorities will prosecute individuals under these provisions. An overseas operator may be found liable where an offence provision is expressly stated to have extraterritorial effect. The offence provisions in the IGA are expressed to apply extraterritorially. However, the practical difficulties that exist in enforcing Australian legislation against overseas operators has previously inhibited enforcement activity under the IGA. This problem was addressed by the Interactive Gambling Amendment Act 2017 (Cth), which conferred new powers on the ACMA, including the ability to notify international regulators of licensees acting in contravention of the IGA. There is no general principle extending liability to directors or officers of a gambling operator for the acts of a company. However, in cases where there is a prohibition on certain activities, certain legislation extends these prohibitions to the directors and officers of the company in line with the aiding and abetting provisions of Australia’s criminal laws. For example, Section 53 of the NSW UGA stipulates that a director of a corporation that is in breach of the NSW UGA will commit an offence where the director ‘aids, abets, counsels or procures the commission of the corporate offence’. At the federal level, directors and officers of operators acting in contravention of the IGA can also be nominated by ACMA to a ‘Movement Alert List’ maintained by the Department of Immigration and Border Protection, with the aim of restricting their travel to or from Australia. As a general principle, various parties may be found liable under the aiding and abetting provisions of Australia’s criminal laws. The broad language of the advertising prohibition also extends liability to marketing affiliates. The Interactive Gambling Amendment Act 2017 (Cth) has also extended liability under the IGA to parties such as business-to-business (B2B) service providers, who may be considered to have ‘aided and abetted’ the commission of either civil or criminal offences under the IGA (see Section VII, below). This will also extend to include directors and officers. Although the statutory prohibitions do not extend liability expressly to entities involved in money transfers where money is used for gambling purposes, payment processors need to be aware that there is risk in certain circumstances that liability may arise under the aiding and abetting provisions of Australia’s criminal laws, as set out above. There is no legislative requirement placed on payment service providers and internet service providers (ISPs) to implement technical measures (such as geo-blocking) to prevent Australians from accessing a site permitting access to prohibited gambling content (including services provided by an illegal, unlicensed offshore operator). 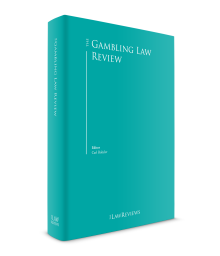 In 2015, the federal government ordered a review of the IGA (the O’Farrell Review) in advance of the introduction of the Interactive Gambling Amendment Act 2017. In its response to the recommendations of the O’Farrell Review, the government indicated that it would discuss with banks and ISPs options for the introduction of payment blocking and ISP blocking technologies as a means of restricting the access of persons located in Australia to illegal interactive gambling services as part of a three-stage plan proposed by the federal government to implement the recommendations of the O’Farrell Review. d keeping records of all transactions, electronic funds transfers, customer identification procedures, AML/CTF programmes and due diligence assessments. Penalties for non-compliance with the AML/CTF Law are significant. In 2015, AUSTRAC filed an action in the Federal Court against three Tabcorp Group companies for ‘extensive, significant and systemic non-compliance’ with the AML/CTF Law. In March 2017, the Federal Court approved a settlement agreement under which Tabcorp agreed to pay to AUSTRAC a A$45 million penalty (and costs) for contravention of the AML/CTF Law. In Australia, match-fixing is dealt with under relevant criminal legislation in most jurisdictions, (e.g., in New South Wales, Part 4ACA of the Crimes Act 1900 (NSW)). Under legislation in most Australian jurisdictions, wagering operators are required to enter into integrity agreements with each relevant racing controlling body and the leading sporting bodies on which they offer betting products.4 These agreements allow the operator to use the statistical information relating to the sporting or racing events (and participants) in return for a fee and on the condition that they agree to cooperate with these bodies by providing information about their customers’ betting patterns and behaviour to assist in the investigation of match-fixing. All Australian companies, including gambling operators, are required to pay corporate income tax (currently 30 per cent5) and goods and services tax (GST) of 10 per cent on all sales. GST is also payable by overseas suppliers of goods and services, including offshore gambling services, to Australian customers. d in some states, a point of consumption tax (PoC Tax), payable as a percentage of revenue derived from customers located in specific jurisdictions (see Section VIII, below). The extent to which advertising of gambling is prohibited depends on the type of gambling in question, the form of the advertising and the jurisdiction in which the advertising is conducted. There is a complex arrangement of rules that regulate the advertising of gambling, including in state and territory legislation, which varies from jurisdiction to jurisdiction. In addition, there are industry codes (such as the Australian Association of National Advertisers Wagering Advertising & Marketing Communication Code), as well as more broadly applicable laws, such as federal consumer laws (which prohibit misleading and deceptive conduct). g offer an inducement to participate, or participate frequently in a gambling activity, including an inducement to open a betting account (the Inducement Prohibitions). Strict laws apply specifically to advertisements published in traditional media, such as on print, television and radio advertising. Recently, the federal government has reformed Australia’s media laws, including by implementing further restrictions relating to the advertising of sports betting in the course of live sports broadcasts (see Section VIII, below). Land-based advertising in pubs, clubs and hotels where retail betting is offered is also subject to restrictions. There are also strict requirements relating to the display of responsible gambling messages, which vary greatly from jurisdiction to jurisdiction. These messages are required to be included with all advertising material that is published by a gambling operator, including at physical and virtual points of sale. e granting of greater enforcement powers to the ACMA, including the power to issue formal warning and infringement notices, seek civil penalty orders and injunctions, notify international regulators and place persons on the Movement Alert List. As a result of the changes, many overseas operators providing online gambling services previously have withdrawn from the Australian market. In September 2017, Tatts and the Australian Lottery and Newsagents Association united to launch the ‘Lottoland’s Gotta Go!’ campaign. The campaign was featured in point-of-sale material posters in newsagents and on television across the country, broadcasting the message that Lottoland, a sports bookmaker licensed in the Northern Territory that accepted bets on the outcome of lotteries, should be prohibited from operating in Australia. In response, various states announced an intention to introduce legislation that would prohibit, or otherwise impose restrictions on, the provision of secondary lottery products to customers located in that state. In November 2017, the Northern Territory Attorney General formally directed the NTRC to remove ‘Australian lotteries’ as an approved betting contingency. This had the effect of causing those lottery betting providers licensed in the Northern Territory to reduce their offering to betting on the outcome of foreign lotteries only. In March 2018, the Interactive Gambling Amendment (Lottery Betting) Bill 2018 (the Bill) was introduced into the federal House of Representatives. The Bill proposes to prohibit the provision of services for the placing, making, receiving or acceptance of bets on the outcome of Australian and overseas lottery draws to persons located in Australia. At the time of writing, debate has not commenced on the Bill. Since July 2017, betting operators have been liable to pay a PoC Tax on bets placed by customers in South Australia at a rate of 15 per cent of net wagering revenue. In early 2017, the federal government discussed the possibility of introducing a point of consumption tax for gambling operators to apply federally. No legislative proposals introducing this tax have been released to date. Recently, however, various other states have announced their intention to introduce separate PoC Taxes, although Western Australia is currently the only state with a specific implementation date (1 January 2019). It is expected that most states will follow the South Australian model, with some regulators seeking public consultation prior to adoption. The NSW regulator has indicated that it will consider stakeholder submissions in April 2018 before announcing their plan to implement a PoC Tax. The effect of the PoC tax on the viability of the wagering market in Australia has not been the subject of any significant empirical study. Accordingly, the repercussions for the Australian racing and bookmaking industries are largely unknown; however, it is likely to impact materially on the costs of the smaller operators and is likely to lead to a greater incentive towards consolidation (see subsection iv, below). In February 2018, the Federal Court of Australia dismissed the application that Aristocrat’s Dolphin Treasure electronic gaming machine (EGM) gave rise to misleading and deceptive representations in contravention of the Australian Consumer Law (ACL). The applicant, an individual, argued that features of the EGM gave rise to an inaccurate representation of the likelihood and value of the return that the player could expect from the machine. Despite the Court’s finding, it is likely that EGM suppliers, operators and regulatory authorities will continue to come under scrutiny from anti-gambling activists and media. Return to player information may also become the focus of subsequent campaigns for regulatory reform, and is an area that the industry may wish to address voluntarily, particularly as increasing publicity is given to poker machine reform as a key election issue. In March 2017, a suite of reforms were introduced that change the way in which sports betting operators are permitted to advertise their services. First, the NSW parliament passed legislation to prohibit the advertising of inducements, such as open account offers and bonus bets that can be viewed by persons in NSW. This has the effect of requiring operators to cease advertising inducements completely, as, on some advertising platforms, it is not possible to exclude persons in NSW from accessing the relevant material without removing the relevant information completely. No date has been set as to when these laws will come into effect (although it is expected that it will commence before 30 June 2018). Secondly, the Victorian government has enacted a law that introduces prohibitions on the display of gambling advertising on public transport, within 150 metres of a school and on public roads, road infrastructure and road reserves. These prohibitions will cover both static betting advertising (including billboards, banners, rolling static displays and the like) as well as movable and digital billboards displaying moving or video images. Finally, the ACMA has approved and registered new industry codes banning gambling advertisements during the broadcast of live sports on commercial free-to-air TV, pay-TV and radio. Similar bans have also been introduced for online advertising by the Communications Legalisation Amendment (Online Content Services and Other Measures) Act 2017 (Cth). In early 2018, the state elections in each of Tasmania and South Australia were held. In each election campaign, a key issue related to the continued availability of poker machines in the relevant state. We anticipate that this will be a recurring feature in future Australian election campaigns. In December 2017, Tabcorp Holdings Limited (Tabcorp) and Tatts Group Limited (Tatts) merged after receiving the approval of the Australian Competition Tribunal (ACT). Authorisation for the merger was granted, despite opposition from the ACCC, Racing Victoria, and online sports bookmaker, CrownBet, who argued that the deal was against the public interest. The merger has the effect of creating a single national tote, which the ACT stated would allow Tabcorp and Tatts to compete effectively with corporate bookmakers. Facing increasing regulatory costs and the greater competition posed by the merged entity that comprises Tabcorp and Tatts, who hold the exclusive right to offer retail wagering services across Australia, it is likely that many Australian operators will look to the international market for support, which is likely to result in further consolidation. This is evidenced by the recent acquisition of CrownBet and William Hill Australia by The Stars Group, which is listed on the Toronto Stock Exchange, in March 2018. 1 Jamie Nettleton is a partner, and Nicola Austin and Mia Corbett are solicitors, at Addisons Lawyers. 2 It is possible for the purchase of a product or service to be a condition of entry. 3 There is also specific state and territory legislation regulating interactive gambling, for example, Chapter 7 of the Gambling Regulation Act 2003 (Vic). 4 Generally, these agreements are entered into by wagering operators with the leading sporting bodies on a national basis. 5 It is proposed that this will be reduced to 25 per cent for businesses whose annual turnover is less than A$50 million by 2026–27. 6 Australian Competition and Consumer Commission (ACCC) v. Hillside (Australia New Media) Pty Ltd t/as Bet365  FCA 1007.